Home »Photoshop»NAPP – more than just a magazine! NAPP – more than just a magazine! Anyone who is serious about Photoshop should consider joining NAPP, National Association of Photoshop Professionals. 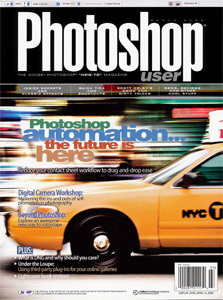 Their monthly magazine, Photoshop User, contains articles written by the leading authors and is filled with real-world uses, skills and applications. Just flipping through the magazine can provide a source of inspiration. NAPP also offers a great selection of DVD tutorials which are discounted for members, as well as member-only content and free online tutorials. NAPP also holds in-person seminars around the country which are also discounted for members. The savings from these discounts easily cover the cost of your annual membership. NAPP also runs incentives to join or renew your membership. The best are the free DVDs (the same ones which are offered for sale). I usually recommend the latest “Best of Photoshop User” which is released every year. It includes videos of many of the best techniques cover in the magazine for that period. ← Previous Previous post: SyFy, really? ?